This stage play script teaches a couple of important lessons. First it teaches about shapes. But it also teaches about bullies. Older students could perform this for younger students as a way to teach shapes but also discuss bullying. A single student or a small group of students could create shape puppets as an art project and then perform the play on video. 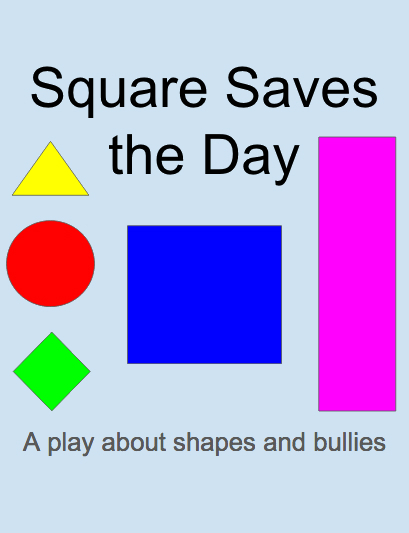 There are many fun ways to teach some important lessons with this play. I wish I wasn’t so square. You’re great at being a square. You’re the smartest one in the class. But look at rectangle. She’s so tall and thin. Look at me. I’m as wide as I am tall. I am too you know. But you’re so well rounded. You’re good at everything. But you still have the best grades, Square. Only at reading, writing and math. And science and social studies. But that’s it. Circle can do it all… especially PE. I’m terrible at PE. Triangle has a point. You should be proud of what you’re good at. And rectangle is so tall. It must be wonderful to be that high. I bet she can touch the sky. Why are you feeling so bad? Did something happen? Did rectangle do something to you? Why did she laugh at you? We were in the school lunch room and they put the cake way up high above the other food. And I couldn’t reach it. Rectangle laughed at me and said that she wouldn’t help me because I was too fat and didn’t need cake. Rectangle is a bit rough around the edges sometimes. Perhaps I can smooth things over with her. The point is that she shouldn’t talk to you that way. She shouldn’t talk to anyone that way. We need to respect each other’s differences. But I’m more like her than anyone else. We both have four sides and four corners. I just wish I was more like her in every way. There are things to admire about every shapes. Each one of us has something special about us. Yes, there’s Heart for example. It’s so great to see you. Thank you for loaning me that Fairy Tale book. It was so romantic. I love the stories about princesses falling in love. You always know the best books. And I would love it if you’d be my partner in science class today. You’re so good at experiments. Especially if you’re my partner. Yes! See you in science. Heart is very good at making things fun. She finds things she likes and loves to do them. It’s always easy to be happy when she is around. She’s great at cheering people up. How’s it going, Triangle? Yo Square. Amazing job at the game Saturday night. He made the game winning score that won the game. I’m lucky to be on such a wonderful team. I was really excited to win the game. It’s fun to play even if we don’t win, but it’s even more fun when we do! You’re a real leader out there. All the younger players look up to you. But I couldn’t do it without the rest of the team. When we got all those new players, I tried to take charge and win the game on my own but it didn’t work. Coach helped me to see that I need the other players to help us win. So I kind of became a teacher and taught them some of the tricks I know that give me an edge. And that helped them be better players and that helped me to do better too. I’m happy to see the team working together again. Let’s hope for another win next week too! I’d love to see you there too, Square. We need all the fans we can get. Okay, I’ll try to make it. I don’t really know how the game works, but I will read a book about it before I come. Speaking of books, do you think you could help me with my math homework? If I don’t keep my grades up, then I can’t play. Oh, wow. Yes, I’ll help you. Help me get good grades and we’ll make you an honorary team member. Even Star looks up to you. But everyone else looks up to him. And you can help the team by helping Star get better grades. I never thought I would help our school’s team. There’s all kinds of ways you help the other shapes in our school. What’s the matter, Square? Did I hurt your feelings? You really need to learn to take a joke. That’s what friends do. They joke around and tease each other. Sure, I’m always teasing Rectangle about who has the nicer clothes and the better hair and the cooler sunglasses. So when you were joking with me, you wanted to be my friend. Well, let’s not get too carried away. You’re not quite the friend material we usually hang out with. Maybe when you stop being so square. Ha! Like that will ever happen. Let’s go, Rectangle. I have to show you this new jacket I just bought. It’s in my locker. You’re going to be so jealous. Come on. You can talk to me. Was it something Diamond and Rectangle said? They are always saying mean things to me too. They think they’re better than everyone else. And they’re always saying how odd I am. So I know what it is like to be odd. Ovals are probably the oddest shape of all. I don’t fit anywhere. It’s hard isn’t it? Not fitting in? But I found ways to be useful. Oval’s are the shapes of eggs. And eggs are a popular food so I dedicated myself to feeding others. Eggs for breakfast. And things like cake need eggs. Everyone loves cake. I decided to make the best of being an oval. Why try to be something else when you can be great just the way you are. Square. With all the right angles, I know you can make it right for yourself too. Everyone! Please! I need help. Baby Moon is stuck! Don’t worry, Baby Moon. We’re here for you. I can’t fit through the hole. It has four sides and I have 5 points. It’s no use. You’re too tall. Let me try. Almost… but not quite. You’re too tall too. I know who will fit through there. Square! Hurray! There’s Square. Four perfect and equal sides. Hurry Square. Baby Moon needs you. The same tall and wide.